Highland Glory, a Norwegian band with a Scottish-sounding name, are one of the few bands I could name from Norway that play straight up power metal in the vein of Gamma Ray, Hammerfall and Celesty. This album is the band's second full-length and was released in 2005. 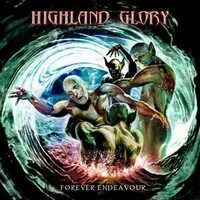 As stated, Highland Glory play power metal. Many may call them generic but I would argue that all of the songs crafted by Highland Glory are hugely enjoyable, well-written songs that reflect the subject matter, whether its about love or battling demons, and are also played well. With the quality of the bands two releases so far you might also wonder why no-one has ever heard of them. The singer on this album is Jan Thore Grefstad, who may be known to readers as the current singer of Saint Deamon. Grefstad proves himself a versatile singer with a powerful voice. He is able to soar in the high notes and inject some undeniable power in his gritty low range. Undoubtedly he is a huge factor in the quality of this album and it is a real shame that he left the band after this album. As you may expect from a power metal album keyboards are quite prominent. However, although they are at the forefront of the music they never seem overdone or out of place. In fact, they keys are undoubtedly the other major contributing factor to Highland Glory's great sound. The rest of the band are all accomplished musicians and display great talent on this album. The guitars have some great melodies and solos and many of the riffs are very memorable. Although overall I don't think this album quite reaches the heights of the 2003 debut, From The Cradle To The Brave, there are still some absolute power metal classics on show here. Mindgame Masquerade is one of Highland Glory's best songs so far and The Sacrifice is a wonderful ballad. The album closer Demon Of Damnation is a top notch epic with some great musicianship and tempo changes on show. In addition the Norwegians have included three stellar cover songs; Iron Maiden's The Trooper, WASP's Wild Child and Kiss' Love Gun. Each of these tracks is a wonderful tribute to the classic originals. The new album, with new singer Trine Elise Johansen, is long overdue so until that is released I suggest you hunt down both Highland Glory's previous albums and see that, yes, Norwegians can do power metal just as well as black and gothic metal!